The Environmental Assessment for the Pine Nut Mountain wild horse management plan near Carson City, Nevada must take into account this herd management area (HMA) is extremely accessible to the public and international tourists with easy access from the San Francisco Bay Area as well as from the Reno International Airport and therefore the Pine Nut HMA must be preserved with the maximum level of wild horses as an educational public sanctuary on public land. The maximum level of wild horses should be determined through rigorous scientific study during a 10 year moratorium on roundups, fertility control and human intervention. Good science must prevail to ensure America’s Pine Nut wild horses–made famous in John Huston’s film THE MISFITS starring Clark Gable and Marilyn Monroe–will not be wiped out due to human intervention resulting in a lack of adaptability to survive climate change, etc. Halt helicopter and other removals to manage the population on the range utilizing reserve design, holistic land management with predation. Predators must not be killed but must fill their niche in the ecological balance of the Pine Nut HMA. 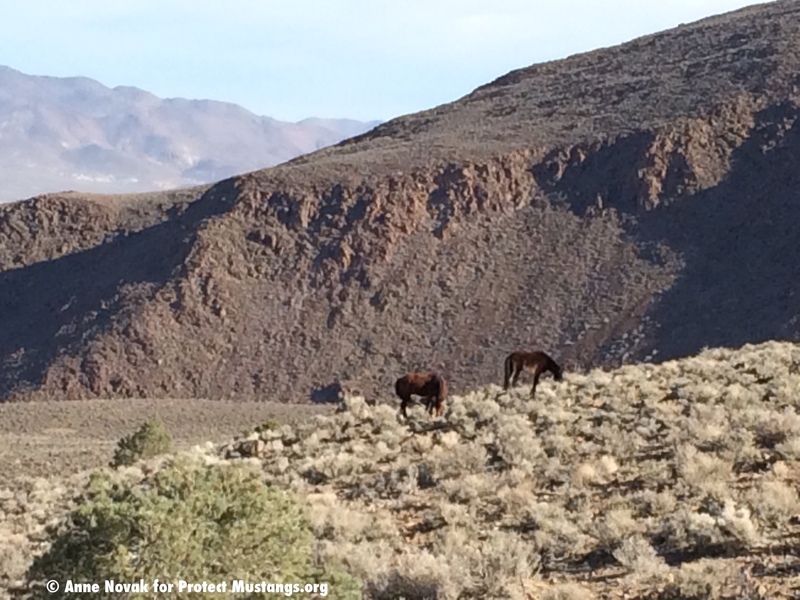 Move back into the HMA any alleged “nuisance” and other wild horses that are residing outside the HMA in areas that are not managed for wild horse habitat or that contribute to public safety concerns such as property damage and vehicle collisions. Conduct a study with a wild horse group to find and implement solutions to keep them inside the HMA. Ensure that wild horses are not fenced off from water at the river. “The old hypothesis — that PZP merely blocks sperm attachment — has been disproved. Kaur & Prabha (2014) found that the infertility brought on by PZP is ” … a consequence of ovarian dystrophy rather than inhibition of sperm-oocyte interaction.” They reported thatPZP’s antibodies induce ovarian dystrophy, oophoritis (inflammation of the ovaries), destruction of oocytes in all growing follicles, and depletion of resting follicles. Despite all the hype about PZP being non-hormonal, the manufacturer himself knew that it had an adverse hormonal effect — significantly-lowered estrogen. In 1992, he reported that ” … three consecutive years of PZP treatment may interfere with normal ovarian function as shown by markedly depressed oestrogen secretion.” Thus, PZP is an endocrine disruptor. Worse yet, Sacco et al. (1981) found that PZP antibodies are transferred from mother to young via the placenta and milk. The transferred antibodies cross-react with and bind to the zonae pellucidae of female offspring. This is bad news because BLM regularly administers PZP to pregnant and lactating mares, who transfer the destructive antibodies to their filly-foals. Thus, the fillies get their first treatment with PZP in utero, while nursing, or both. Nettles (1997) found an association between PZP and stillbirths. In 2015, the International Society for the Protection of Mustangs and Burros reported that 7 mares previously treated with PZP, when taken off it, were able to get pregnant. However, 6 of those 7 mares — that is, 86 percent — produced foals that were stillborn. All other ISPMB mares that had not been previously injected with PZP successfully birthed healthy foals. Environmental and other conditions were identical. The only variable was PZP. Meanwhile, over on the East Coast, the Corolla herd, long-managed with PZP, has recently experienced birth defects among its newborns. Gray & Cameron (2010) questioned the supposed benefit of PZP-sterilized mares living much longer than their normal life expectancy, and and Knight & Rubenstein (2014) warned of unintended consequences of PZP’s ironic effect of extended longevity. Ultra-elderly mares take up scarce slots within AML-restricted herds. They consume resources but no longer contribute to the gene-pool. It is detrimental to a population’s genetic viability to carry significant numbers of sterile herd-members way-beyond their normal life-span. Meanwhile, those few foals that are born have to be removed to achieve AML because they’re more adoptable. Ransom et al. (2013) conducted a longitudinal study of three herds currently being managed by PZP — Little Book Cliffs, McCullough Peaks, and Pryor Mountain. They found that the the birthing season lasted 341 days — nearly year-round — which puts the life of mares and foals in jeopardy. Nature designed the equine birthing-season to occur in Spring, not year-round, and certainly not in the dead of Winter. PZP’s manufacturer conceded that it could take up to eight years to recover fertility after just three consecutive PZP treatments. The study on PZP by Knight & Rubenstein (2014) found that ” … three or more consecutive years of treatment or administration of the first dose before sexual maturity may have triggered infertility in some mares.” These findings are particularly troubling. They suggest that, actually, only two consecutive PZP-treatments may be reversible. Except, that is, in the case of fillies who have not yet reached puberty — they could be sterilized by just one injection. PZP, GonaCon, and Sterilization would ruin natural behavior that we specifically go to the Pine Nut HMA to study and enjoy. Therefore this junk must not be forced upon wild horses. No experiments. No collars. Respect their right to true freedom. We request you re-evaluate AMLs to accommodate the present wild horse population without removals, making forage adjustments, if necessary, pursuant to CFR 43 C.F.R. 4710.5(a). Conduct a complete headcount and public database with individual photos of every wild horse on the Pine Nut HMA with their basic information. Follow the wild horses and note all the deaths. Do you know even how many have died since birth in the past 2 years? How many have died of natural causes including predation and how many have been shot or poisoned by humans? Increase penalties for killing wild horses. Include a complete identification and analysis of the various causes of land degradation — AND their corresponding degree of impact — including but not limited to motorized uses (OHV, etc. ), extractive uses (mining, etc. ), various recreational uses, and other uses for each area, inside and outside of HMAs, analyzed in the EA. The Environmental Assessment must include a complete disclosure and analysis showing the degree of disturbance that each of the following negative impacts has on the bi-state sage grouse: renewable energy projects, extractive uses, motorized vehicle uses, recreational activities, power lines, fencing and other man-made structures have on the bi-state sage grouse behaviors and habitat–mapped and analyze for the degree and range (circumference) of impact each has on bi-state sage grouse behaviors and habitat within the HMA. Analyze the HMA exclusively to be used for wild horses and other wildlife to prevent the degradation of public lands within and outside the herd management area. Expand the HMA if needed to the original acreage designated to wild horses. What would the impacts be and how would the thriving natural ecological balance and Sage Grouse flourish? We will not allow wild horses to be scapegoated for damage caused by other species or land users. Thank you for allowing us to participate in the public process. Only 332 Pine Nut wild horses left on more than 90,000 acres of public land set aside for their principal but not exclusive use and BLM still wants to decimate the herd. Protect Mustangs went out on the Pine Nut range, near Carson City, last Friday after the judge’s ruling and found less wild horses than we hoped we would. This herd is probably the most famous herd in Nevada from the film The Misfits, starring Clark Gable and Marilyn Monroe. We are grateful to have found the Pine Nut wild horses living in peace and harmony on their native land. For now they escaped the cruel roundup, forced drugging, removals and tearing apart of families forever. Thanks to Friends of Animals’ & Protect Mustangs’ Pine Nut lawsuit–currently active in federal court–these wild horses won’t be shipped off to sordid holding pens without shade or shelter from the elements. Those over 10-years-old won’t be shipped to slaughter while we continue to fight in court for what’s right. Wild horses must never be forced to live in zoo-like settings with humans running a PZP-based breeding program–abolishing the survival of the fittest. This would manage them to extinction. There is a lot of misinformation and fear mongering going around about our Pine Nut lawsuit. Some Spin Dr.s are making false claims to confuse the public and their followers about the PZP issue within our lawsuit. Here are the facts: PZP doesn’t stop roundups. The BLM would need to roundup the herd with helicopters to give them the EPA approved pesticide–made from slaughterhouse pig ovaries–known as PZP. Then they would use that as an excuse to rip 200 wild horses from their native land–never to return. Today the herd is underpopulated on the range. When nature’s balance is disrupted and there aren’t enough left to help eat the grass, then catastrophic wildfires will occur. The BLM’s chosen management number for the Pine Nut wild horses is outrageously low. We are so grateful justice is unfolding in court but the wild ones need your help. The Pine Nut wild horses are very, very happy they have been spared for now. It’s essential to get technical services for court evidence to keep them free and safe in the wild. 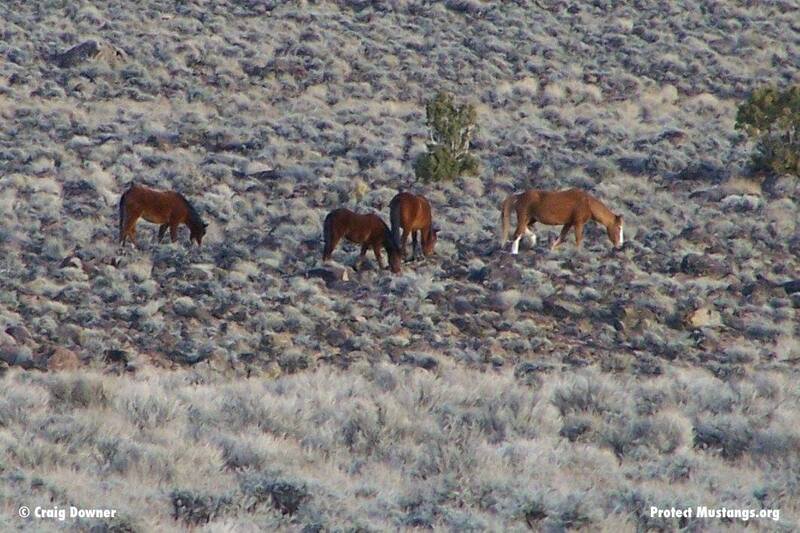 If you would like to take direct action to help these wild horses continue to live in freedom, please make your tax-deductible donation today right here: http://www.gofundme.com/lqsy50 and please share this post widely. Thank you, because it takes a village. Hicks said that with the proposed Pine Nut roundup, which was slated to begin Feb. 20, 2015, the BLM has failed to satisfy the National Environmental Protection Act (NEPA) and other federal laws that are applicable. “Accordingly, the court finds that the public interest will be best served by enjoining the BLM’s proposed gather, at least until the court has an opportunity to fully consider the merits of plaintiffs’ claims,” Hicks said. “I would say this is a major victory for wild horses and reflects rising concerns about rounding up and drugging wild horses with PZP,” added Jennifer Barnes, staff attorney with FoA’s Wildlife Law Program. February 11th Court order granting preliminary injunction: PM Pine Nut Order Granting Preliminary Inj. The French came to Nevada to report on the mustang crisis. At first the director and cameraman believed the BLM but as the shoot played out they saw the truth. I would say the turning point was when the BLM guards and PR people tried to prevent them from filming what they came to film at the roundup. They should have known better. Never infringe on a French person’s liberty. Vivre la France!